Eating out on a restricted diet can be difficult because every restaurant tends to load its dishes with salt, fat, sugar or all three. If you do find something you can eat, it likely won’t be a large enough portion to fill you either and you’ll just go home hungry and irate about your new limitations. One solution I’ve found it to frequent all-you-can-eat salad buffets. In my area, I have two to pick from, Ruby Tuesday’s and Sweet Tomatoes. 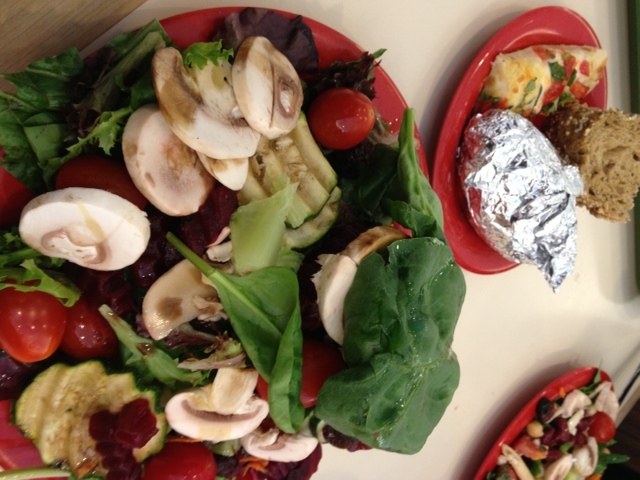 A recent first trip to the salad buffet for me at Sweet Tomatoes. Ruby Tuesday’s is good for a quick lunch salad but to really chow down, I enjoy Sweet Tomatoes. Check the website to see if there’s one in your area and if not, look for something similar. The sites lists 15 states with locations, under two different chain names. In addition to various kinds of lettuce and add-ons, it offers olive oil and vinegar as a dressing option so you can avoid high sugar, high salt dressings. It also offers plain baked potatoes, which are fine for my diet (check on yours), multigrain bread which I can also eat, and fat-free soft serve ice cream for dessert (it used to carry Edy’s fat-free frozen yogurt but has gone a bit downscale on that front recently, the Edy’s was tastier). Items I avoid there are soups (too much sodium), pizza bread (sodium and fat) and pasta dishes (carbs, salt)and brownies (salt, sugar, carbs). Even without those, though, I can fill up on three trips to the salad buffet and dessert.